20-Oct-2007 -- Having registered several confluence points in our home region of the middle east when we saw that there were some, as yet unvisited in an area of Chile that we planned to visit on holiday it was inevitable that an attempt would be made. Our initial plans for a 4x4 were destroyed at the last moment but luckily we were able to get help in San Pedro de Atacama from Martin Rihs, a swiss mountain guide based in the region, who agreed to come with us in his 4x4. We set off from San Pedro at 6.00am before dawn with plenty of food, water and additional petrol because having planned an approach route with Martin it was clear that we would end up driving quite a long route to get there and back and Martin confirmed that there was no petrol available anywhere in the region of the Andes that we were visiting. 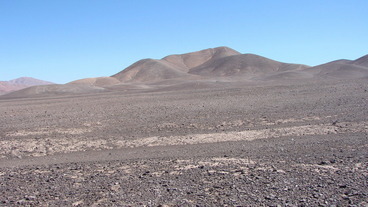 About 100 km South of San Pedro we turned West to cross the large salt desert, Salar de Atacama what made this more interesting was passing 3 extremely large Lithium mines from where a large percentage of the worlds' Lithium is produced. The whole region is a major source of raw materials mainly copper and Lithium but many other metals also. Continuing west out of the desert we eventually came to a large flat bottomed valley running N - S that we had identified as a potential approach. Luckily the valley proved to be quite easily navigable and we followed this for about 35 kms making quite good time until we had to turn SW to head to the confluence point. Fortunately we found ourselves in another fairly easy valley and as we drove over a low hill we were there, some 4.5 hours after setting off. The point itself is on the side pf this low, gently sloped hill and customary photos were taken note also the altitude showing on the GPS, almost 8000Ft - quite low for the area. Since the day was still young, on Martin's advice we went off to visit a meteor crater at S23 55.66, W 68 15.694 worth a visit if you are off roading in the area!